Lock in a great price for Blue Sky City Beach Hotel – rated 8.6 by recent guests! From the minute we arrived until we left, the staff were super, friendly, helpful and made us feel warm and welcoming. Wonderful pool area with plenty of sitting to accomodate the guests. The rooms and bath were very nicely done in a sleak modern contempory feel perfect for relaxing after a day walking around the "old" city which is only a 10 minute walk. We enjoyed our stay at this hotel and would gladly recommend this to other guests!! We booked a deluxe room and well worth the money with kettle ,mini bar (charge for drinks) and a free safe (just a deposit which was returned). About 15 minutes stroll to the beautiful old town where there were plenty of shops and restaurants. Couldn't fault this hotel ! Staff are friendly, feel like home , very comfortable, pool is great , location is excellent . Couldn't have chosen a better hotel for my business trip. The location was great, the hotel provided all the amenities that I needed to make my stay comfortable, and the breakfast was delicious. Very friendly staff, Michalis and Eleftheria at the reception make sure I had all I needed. Overall a great stay and fantastic value for money. I was there on a business trip, but will definitely visit again when on holiday! Staff was very friendly and supportive and the service was impeccable. There was a large variety of food options for i breakfast. The room, was beautifully decorated, clean and comfortable. Staff were very good. Excellent service. Always willing to help. Location was great a short walk to old town. Breakfast had a big range of food. I enjoyed all the range offered. 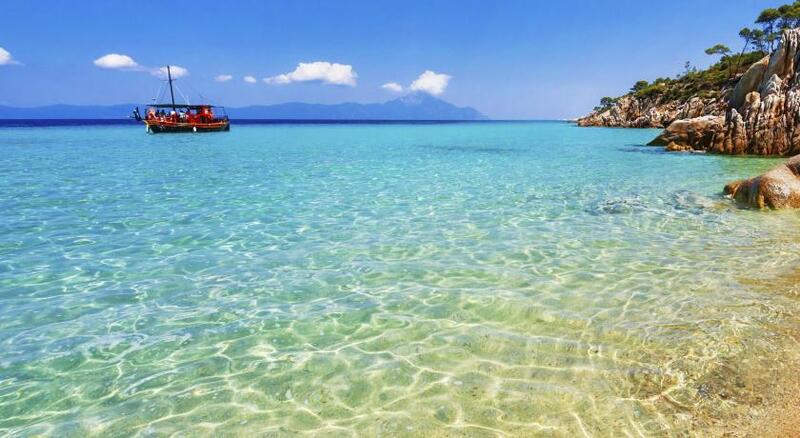 I would definitely come back. The location of the hotel was very good. receptionist Mihail was very friendly and helpful.The choices at breakfast were quite high. The staff were amazing. Very helpful with bookings and directions. Staff are all really friendly. Michael on reception, in particular, will always check if everything is ok and quickly rectify anything (We said we didn't have many hangers and more were delivered in no time) His memory for names is amazing. We were called by our first names by him the whole stay and it's a big hotel. Bedding and towels were changed every single day and the whole place is spotless. Breakfast buffet offered loads of choice. Sea view rooms have a lovely view of the sunset. Location is good (We were worried there maybe noise from the nearby strip or the main road but neither were a problem) lots of places nearby to eat/drink and old town is only 10-15 mins walk away. Blue Sky City Beach Hotel This rating is a reflection of how the property compares to the industry standard when it comes to price, facilities and services available. It's based on a self-evaluation by the property. Use this rating to help choose your stay! 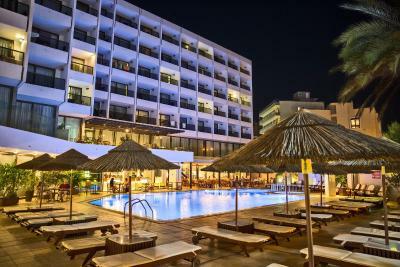 Located just opposite Psaropoula Beach, Blue Sky City Beach Hotel features a pool with hot tub area and a cocktail bar. The 4-star resort offers air-conditioned rooms with private balcony. 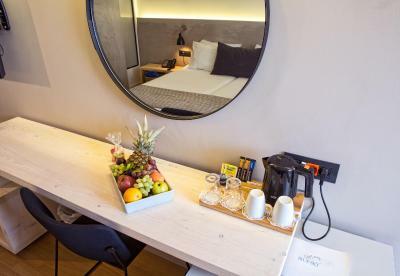 Each of the classically furnished Blue Sky Hotel’s rooms features a satellite TV, safe and mini-bar. Many of the guest rooms enjoy views of the sea. In-room WiFi is available at extra charge. Guests can relax at the hotel’s large swimming pool offering free sun beds and umbrellas. The hotel’s mini spa features a sauna, hot tub and gym. American buffet breakfast is served daily. The hotel’s restaurant serves à la carte, as well as buffet dinner menus. A lighter fare is available at the Blue Sky Hotel’s pool snack bar. The reception is open 24/7 and offers car rental service. A gift shop and a mini market are available on site. All public areas of the hotel are air conditioned. The Blue Sky City Beach Hotel is a 5-minute walk from Rhodes’ Medieval Town. The center and the Aquarium are less than 10 minutes’ walk. Free parking is available in public area close to the hotel. When would you like to stay at Blue Sky City Beach Hotel? Air-conditioned room with satellite TV, mini-bar and a private balcony enjoying inland views. It has a private bathroom with bath tub. Air-conditioned room with satellite TV, mini-bar and a private balcony enjoying unlimited sea views. -access to gym and spa facilities at discounted prices. Air-conditioned room with a balcony and a private bathroom with shower. House Rules Blue Sky City Beach Hotel takes special requests – add in the next step! Blue Sky City Beach Hotel accepts these cards and reserves the right to temporarily hold an amount prior to arrival. Please inform Blue Sky City Beach Hotel of your expected arrival time in advance. You can use the Special Requests box when booking, or contact the property directly using the contact details in your confirmation. Nothing to add. Everything was perfect!!! Didn't stay long enough. Elevators are small. But it was not an issue. The location to the beach was fantastic as it was just across t he road, but what unfortunately this side of the island is very very windy and quite uncomfortable to sit. If your nor a beach person then it's only 10 mins brisk walk to old town. Breakfast food could have been hotter but we probably didn't time it correctly. Towels were on sun beds really early and there weren't many sun beds compared to rooms so didn't spend much time around the pool. The free shower room on departure was like a sauna. It was impossible to get dried in there. Gym working hours, rooms are oldschool style, breakfast like in Soviet times. Reception staff was very nice and friendly. Good location if you would like to visit old town. They replaced my mattress which was comfortable and the staff were helpful.